Malaysia suspended three of its largest China-backed projects worth $22 billion on Thursday. The projects in question are the $20 billion East Coast Rail Link and two pipeline projects that cost more than $1 billion apiece. 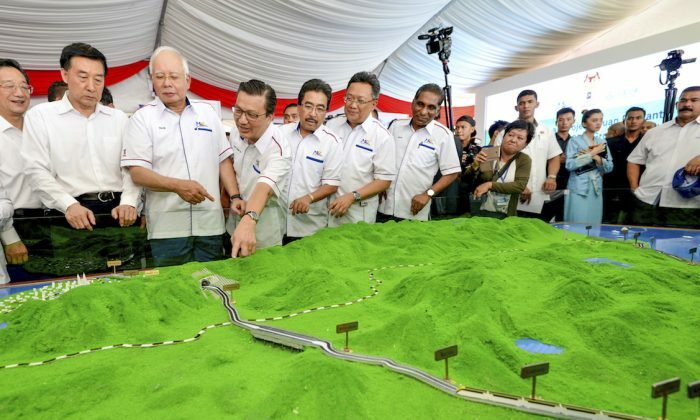 The suspension came just a day after Malaysia Finance Minister Lim Guan Eng called for a sharp price reduction to the 428-mile East Coast Rail Link, after discovering that the project’s actual cost is $20 billion (81 billion ringgit), nearly 50 percent higher than what was estimated by the previous government. The rail project, which would connect Malaysia’s less-developed east coast to southern Thailand and Kuala Lumpur, is a key part of the Chinese communist regime’s regional Belt and Road infrastructure initiative. It is largely financed by China and the main contract was awarded in 2016 to state-owned China Communication Construction Company (CCCC) by then Prime Minister Najib Razak. Mr. Najib had been defeated in the May 9 elections and was charged with corruption over the 1MDB (1Malaysia Development Berhad) fund on July 4, 2018. He is accused of taking $700 million from a state fund he had set up, BBC reported. According to the Financial Times, Malaysia Rail Link, the government company supervising the East Coast Rail Link, sent letters to CCCC and CPPB on Wednesday, informing them of the project’s suspension due to excessive costs. CCCC said no duration was given for the suspension and that it could spark additional costs, losses, and damages. “We also hope that the suspension will be lifted as soon as possible,” it said in a brief statement. The project also has the most strategic importance to the Chinese regime. “Out of all the projects in Malaysia it’s the one most closely associated with [the] Belt and Road Initiative, so that will be the project Beijing will be most anxious about,” Peter Mumford, Asia director at Eurasia Group, told the Financial Times. The suspension of the three projects is another manifestation of newly elected Prime Minister Mahathir Mohamad’s call to cut the Chinese regime’s influence in Malaysia. The Malaysian authority is also reviewing other large infrastructure projects financed by China, according to the Associated Press.